We recently received a shipment of books from our Macdonald campus library for a new digitization project we’re starting up this summer. 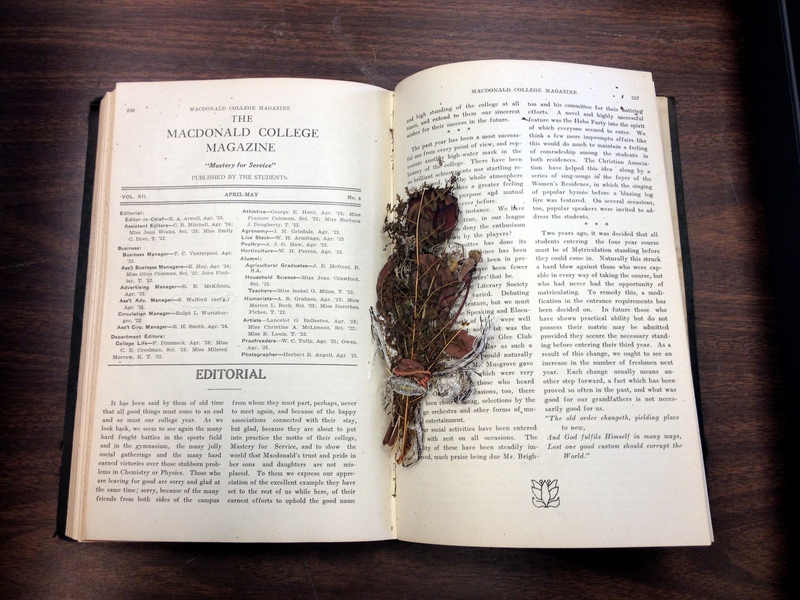 While going through the volumes we came across the unusual find of what we think is a pressed corsage! Flowers found in the pages of the Macdonald College Magazine – volume XII, No.4, April-May 1920. p. 236 – 237. The Macdonald College magazine was published between 1910 and 1932 by the students and contained articles on student activities and other various topics, specifically agricultural ones. The magazine also contains a number of advertisements for local businesses which will be valuable in the student of Montreal and McGill history. 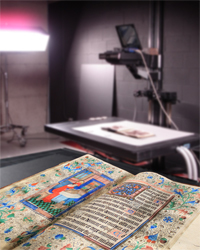 This spring we’ll be digitizing the full run and making it available online. For more information on Macdonald college campus visit the history feature, Founding Macdonald College. 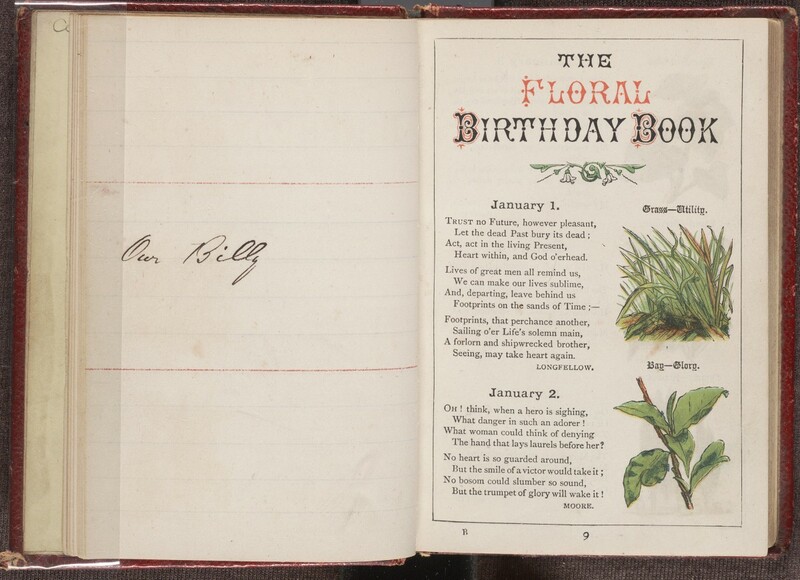 This charming book aided its owner in remembering the birthdays of friends and acquaintances. The printed calendar, which assigns a plant to each day of the year, lists an associated quality, and presents a short poem, was interleaved with blank lined pages providing a place to to record names adjacent to each day of the year. Additional pages of this small volume reveal names written in multiple hands, suggesting that it functioned as both a memory aid and an autograph book for its owner – a place to collect the signatures of their beloved. The printer Edmund Evans became known for exactly this sort of inclusion of vivid colour printing within an intricate page layout, which would have been something of a novelty at the time. You can find out more about ‘Sentimental botany‘ in the digital exhibition ‘Interpersonal Botany: Interactions between people, print and botany 1700-1900‘ which was organized by McGill’s Interacting with Print research group and the Rare Books & Special Collections.